Heads up! Before you hit the road -- for a business trip, spring break, or that yearly family vacation -- read up on our best tips for eating smart on the go. Everybody in? GOOD. We recommend packing snacks for all excursions, even minor ones -- this way if plans get derailed, you're prepared. But stocking up on sensible food options is extra-important when you're leaving home base for a while. Keep plenty of stuff handy to get you to your destination. (Who knows what crazy-fattening items you'll encounter along the way?) 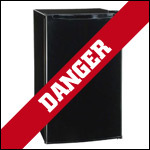 Once you arrive, if you have a fridge available, pick up some smart chilled snacks to keep you out of trouble. Stuff It in a Sack: Snack bars with protein and fiber, mess-free fruit (like Fuji apples), 100-calorie packs of almonds, jerky, hard candies, and sugar-free gum. Get It Once You're There: Ready-to-eat fresh fruit and veggies (like cut-up cantaloupe and carrot sticks), light cheese snacks (like string cheese), fat-free yogurt, and guilt-free craving-busters that wouldn't travel well (like easily crushed low-fat chips and 100-calorie cookie packs). 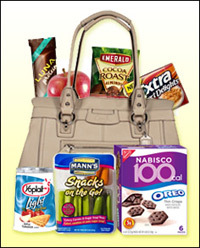 Click here and here for our top picks when it comes to emergency snacking! Road-Trip Picks - The good thing about road-tripping? You can stop wherever you want! Aaaand that's also the dangerous thing about road trips. But what's the point of indulging in junky food ON THE WAY to your vacation spot? Save the splurging for the special stuff, and eat right on the way there (and back). Snacks high in protein and fiber are key, and it's a good idea to have a mini cooler stocked with items like water (plus other no-calorie drinks) and cut veggies 'n fruit. If you KNOW that you're gonna want sweet and/or salty snacks at some point, portion 'em out into single servings before you leave. 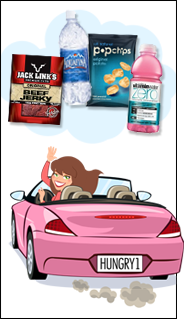 It's way too easy to idly munch through five servings of chips or cookies on a long car ride. Click here for even more ideas -- and drive safely! Snacks on a Plane - When it comes to take-along items, you want things that don't require a lot of room and won't get destroyed in your carry-on bag. (Refer back to the Stuff It in a Sack list above.) Air travel can dry you out and make you thirsty (which can also make you feel hungrier), and the drink cart doesn't come by that often. So snag a big bottle of water from an airport shop before boarding. And while some airlines are getting better about providing calorie-conscious food options, others are not. (Click here to see our pal the Diet Detective's latest annual airline survey.) Leave yourself time to shop around in the terminal for the best fit -- many airports have plenty of salads, sandwiches, and other meal options that are better picks than anything on board. "What would HG eat?" For breakfast, an egg-white omelette (no cheese, lots of veggies) and some fruit with a cup of coffee (splash of skim and a no-calorie sweetener packet). Light and simple, yet TOTALLY filling. 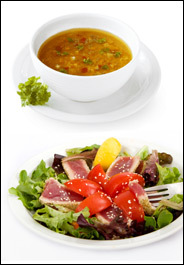 For lunch, broth-based soup and a giant salad topped with grilled chicken or seared ahi tuna -- dressing on the side; dip, don't pour. Wanna be more adventurous? Go for it! Just nicely request the occasional tweak -- light on the cheese, tomato sauce instead of cream sauce, and extra veggies (please!). In the afternoon, one of the aforementioned emergency snacks makes an excellent nosh. For dinner, sushi or lean protein with a bunch of veggies on the side is pretty much the Hungry Girl special (click here for sushi ordering advice), but the same special-order-something-fun tips from lunch apply. The bread basket and starchy sides are trouble; not worth it. A few forkfuls of dessert? Totally acceptable! Amusement Parks - Some of the calorie counts for theme park foods are scarier than the roller coasters. Be prepared! Tropical Paradise - Heading to Hawaii (or somewhere like it)? It's TOTALLY possible to keep your food intake in check. Pass this email to your travel companions and anyone else who could use these helpful tips -- click "Send to a Friend" now! Who's hungry for peach cobbler? WE ARE. Today is April 13th, National Peach Cobbler Day, so we'll be celebrating with this fruity-licious recipe!